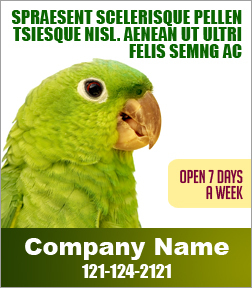 A 3.5 x 4 inch square corner bird care magnet aids advertisers who sell bird care supplies or those who run bird care parlors. This magnet can be sought by every newbie and established advertisers because it offers them high visibility against all odds. It is specifically designed by keeping the low budget advertisers in mind. They can customize it for lowest amount and seek discounts on large orders.